WTI is trading near $63.50 during today's early sessions as the black gold couldn’t extend its previous upside after comments from Russian Finance Minister and IMF question buyers. Positive developments surrounding the US-China trade deal and welcome data from one of the world’s largest oil consumer, China, fueled WTI prices to $64.65 on Friday. Though, the quote still falls short of clearing current month high near $64.80. Crude oil prices are returning to the same point to find support by the $63.43 level after failing again and again to break above the $64.48 resistance level. 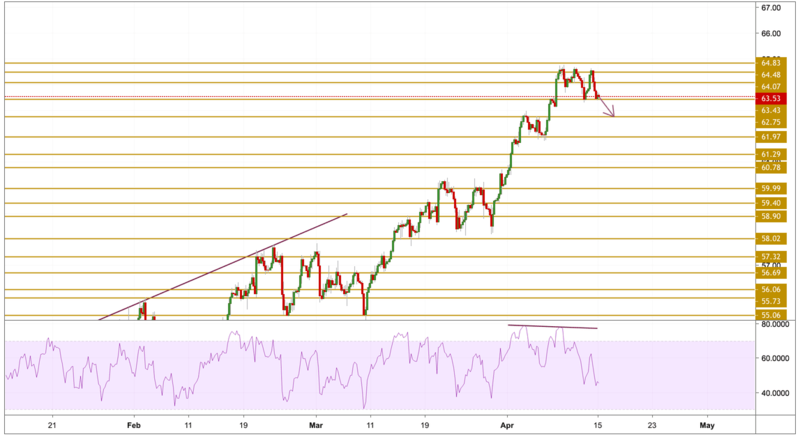 The price is currently hovering around the $63.5 level and the momentum is again declining as it is point out by the RSI on the chart below. We expect a break of range to the downside and we will be focusing on the $62.75 support level.